THIS year we have 1 new addition and 1 re-entry in our calendar tours schedule. 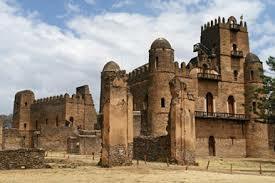 The Sheik’s tour is a new itinerary which has already proven to be a success amongst our custom made tour clients. Great off-road riding in a seldomly visited part of the country: the southeast and the Bale Mountains. 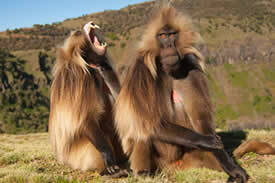 The re-entry has been made by our Ultimate Tour riding through the Danakil Depression and the Simien Mountains. 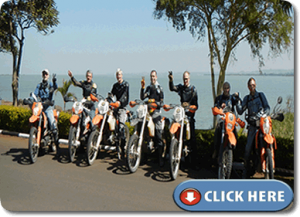 The Lake Victoria Motorcycle Round trip Tour this year will take place in August – September 2014 and the Black Elephant tour has been antecipated by a few weeks to fool the rainy season (hopefully!). The remaining 2 calendar tours are already established itineraries in our calendar: the wild and ethnic tour and the historical route. 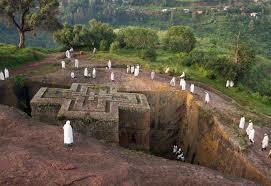 Together they will take you through the most well known historical places in Ethiopia and the most well known tribes. If none of these tours is what you are looking for just get in touch with us for a custom made tour and we will send you a personal itinerary and quote based on your requirements. We have many more itineraries available for all skill levels from novice to expert riders and if we haven’t done it yet we will design it and test it just for you! Check our custom made tours page often as we will sometimes post booked trips which you may join. 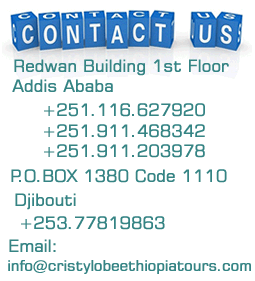 Highlights: Simien Mountains National Park, Lalibela Rock-hewn Churches, Castle-palace of King Fasilidas, Frescos of the Church of Debre Birha Selassie, Island Monasteries of Lake Tana, Slabs and Monolithic Obelisks of Axum. Highlights: Langano Lake, Shala and Abyata Lakes National Park, Rift and Omo Valley, Lake Chamo boat trip, Hippos and Crocodile display, Dorze, Chencha and Konso villages, Turmi, Lake Stephany, Lake Turkana, Mago National Park, Hammer, Geleb and Karo tribes. Highlights: Danakil Desert, Asale Salt Lake, Geysers and Sulphur Pools, Salt water ponds, Erta Ale lava lake, Camel caravans, Salt mining, Simien Mountains National Park, Lalibela rock carved churches, Castle-palace of King Fasilidas, Frescos of the Church of Debre Birha Selassie, Island Monasteries of Lake Tana, Blue Nile Falls, Slabs and Monolithic Obelisks of Axum, bad and good asphalt, gravel, dirt, sharp stones, sand and bushes, ride above 3,000 metres above sea level and 80 metres bellow sea level, through amazing unique and unbelievable scenery. Highlights: Great riding in off-the-beaten track routes in sandy and gravel roads with some technical parts, Bale Mountains National Park, Bale plains, Sof Omar caves – the 2nd longest cave system in the world, Muslim Pilgrimage sites, Lake Langano. Highlights: Omo and Gambella National Parks. 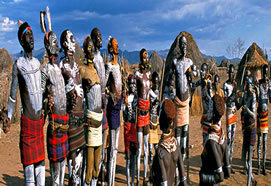 The Omo river and a number of other rivers, all of which drain into the Omo; the important Mui river crossing the middle of the Omo park; Lake Turkana, the Maji mountains and the Sharum and Sai plains, the Lilibai plains and Dirga Hills; Bebeka coffee plantation; Hot springs and mineral waters, waterfalls, densely natural forests; Mursi, Suri, Nyangatom, Anuwak, Surma and Nuer tribes. Highlights: Ethiopia, Kenya, Tanzania, Rwanda, Uganda; Omo National Park, Omorate, Eliye Springs, Omo River Lake Turkana, Lake Bunioni, Lake Victoria, Kagera river, Victoria Nile, Rusumo Falls, Equator crossing, Samburu National Reserve, South Turkana National Reserve, Jinja, Langata Giraffe Center, Nairobi Animal Orphanage, Riding on asphalt, gravel, compact and loose dirt, stony, bush and beach roads/tracks, Magnificent ever changing landscape.